Elinor Tomlinson moved to New York armed with a journalism degree and a dream. Instead, she’s working as a nanny and sleeping on a foam pad in a weird apartment. So when Elinor is offered a job at Journalism.ly, the digital media brainchild of a Silicon Valley celebrity, she jumps at the chance. There, Elinor discovers her true gift: she has a preternatural ability for writing sharable content. But as she experiences professional success, the rest of her life falters: her boyfriend dumps her, two male colleagues insist on “mentoring” her, and a piece she writes about her personal life lands her on local television. As Elinor grapples with the bewildering etiquette of online dating, the preening male ego, and the capricious nature of Internet fame, she faces a new challenge—how to reconcile her internal self with the world of thoughts and feelings online. 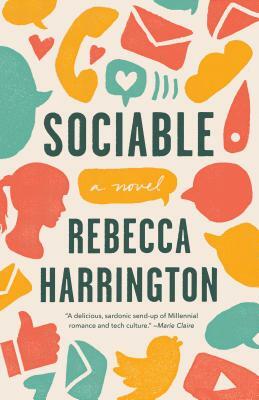 REBECCA HARRINGTON is the author of the novel Penelope and the comic essay collection I'll Have What She's Having. Her work has appeared in New York Magazine, The New York Times, Elle, NPR.com, and other publications. She lives in New York City.